Approximately 14 pieces in a pound. This gift tin has a diameter of about 7 in, a height of about 2 in and a Net WT of 24oz. Looking for the ultimate gift of good taste? These amazing little gems are often called “candied apricots” because they’re so wonderfully sweet, and universally loved by those who appreciate the finer things in life. And make no mistake about it, our genuine Superior Glazed Apricots rank very high on that exclusive list! We’re proud to present the very finest glazed apricots in the world for your gift giving pleasure, carefully selected for maximum eye appeal, quality and flavor. Gently gathered and sorted at the peak of the Apricot harvest, dried to plump perfection under carefully controlled conditions, and then drenched in a delicious sweet apricot glaze made from pure cane syrup, these beauties take a back seat to no other candied apricots to be found anywhere. If you like, we can send our Superior Glazed Apricots direct to your recipient for you—a pound-and-a-half of sweet golden sunshine snugly nestled in our elegant gift tin, accompanied by a lovely card conveying your best wishes. You may have enjoyed dried apricots harvested from celebrated groves in Turkey, the Middle East, California, India or elsewhere…and there’s no doubt that all are wonderfully delicious. But the apricots grown in northern Australia are simply the best of all, due to the soil composition and ideal climate for growing and ripening these extra-large, succulent fruits. Our Superior Glazed Apricots are literally the cream of the crop, and we select only the best of those for inclusion in our Gift Tins. We guarantee your recipient will recognize and appreciate the unmatched quality of your gift. The wondrously firm-soft texture and rich, sweet-tangy flavor make these candied apricots the perfect gift with which to celebrate an important birthday, career milestone or holiday remembrance. When the occasion calls for a truly impressive gift, nothing brightens a day quite like our Superior Glazed Apricots Gift Tin! Apricots, Sugar, Corn Syrup, Citric Acid, Preservative (Potassium Metabisulfate). Allergy Information: This product is produced at a facility producing peanuts, tree nuts, wheat, soy and milk products. May contain peanuts, tree nuts, wheat, soy and milk products. We enjoy glazed apricots as our dessert in the winter time. Your product is the best that we have sampled. It is the most rewarding part of a cold dreary winter day. Prosthe size of the apricot is perfect and each one is uniform in size; the glaze permeates the apricot so the fruit is not sticky but moist; the amount of fruit is satisfying. ConsAt times the tin is difficult to open. I get these every year for my mom for Christmas , she really enjoys them. They are juicy, plump, and sweet. Excellent Service and Excellent Apricots!! Candied Apricots are my husband's favorite. I always try and give them to him for Christmas. The ones at Superior Nut Store are the best I've found ANYWHERE. They are huge and very flavorful. This year, I had a problem with my shipment. The package was sent quickly and correctly, but when it arrived at my PO Box, someone else took it. I tried for days working with the UPS Postal store trying to locate it. I thought this was the first year that my husband wasn't getting his apricots. Out of desperation; I called Superior Nut Store's customer service and explained that thru no fault of theirs, I didn't receive my apricots. The person took my information and told me someone would be in touch. I thought..yea right; however, within less than 10 minutes, I received an email from them stating that they would mail me a replacement order and to return the first if it is found. That's excellent service!!! My husband got his favorite apricots for Christmas and I've been raving about the quality of the product and the excellent service to everyone I see. Thank you!!! You have a lifetime customer! Nutritious! A novel gift! All recipients of this Christmas gift were delighted! Actually, these were gifts to our doctors. Well, my husband is eating the small can of apricots. I do not eat those because I have been diabetic 62 years tomorrow. I can say one thing, YOU HAVE THE BEST AND EASIEST WEBSITE to order from and I have been on a lot of different ones. I do understand that you do not carry the number of items that some sites carry; but anyway it is a pleasure to order from you. Thank you so much. I went on one site and just finally gave up on them. I had Australian glazed apricots a very long time ago and went on-line to find them again. The place I purchased them before was still selling them but I decided to try the Superior Nut Store because they were $5 less expensive and the ratings were all excellent. I was happy that the product was excellent as I remembered it from a long time ago and I received it from a reliable source at a lower price than the other place that I had always purchased them before. I'm very happy with my purchase! ConsI love the product but they're a luxury item that I only treat myself with periodically. They're very expensive for what you get. These Australian Glazed Apricots are absolutely delicious and look just like the picture shows: large, plump, and perfect! We bought them to put them exclusively in our bran muffins, and they are incredibly awesome! ProsDelicious, plump, and large. Tin keeps them fresh. I was extremely pleased with my purchase of Australian Apricots. Excellent taste. They are very large, moist, fresh and a wonderful treat. This is my first time to order from Superior Nut and I will certainly be a return customer. In the past several years I have ordered them from a well-known retail store but this year they switched to domestic ones. Glad I found Superior Nut. My wife loved these as a Christmas gift, she has not had them in years. Freshest preserved, plump, big and sweet apricots from anywhere! Thank you for your superior products. Outstanding, large and plump and delivered promptly. Great snack that's cheaper than buying at Neiman Marcus. ConsExpensive but still cheaper than Neiman Marcus. Sent these to my mom as a special treat. She absolutely LOVES them and other family members agree! I've been told they are the best apricots ever. Can't wait to try them myself! Growing up my mom and grandmother would buy glazed apricots every Christmas from a high end store. They were part of Christmas but unfortunately about $4 per apricot. Well I am happy to say I have a new supplier for our holiday apricot habit! These are delicious, plump, juicy, sweet and beautiful. Wonderful for the family and a great gift. We will be buying these often! This is my second order of the apricots. Yummy as usual! Excellent product, delivered as promised. Delivered timely and in excellant condition as a gift. Delicious!! Don't hesitate to get these! I sent these to my mother for Christmas and she loved them. This is the first time ordering from your company and I was pleased with the product and service. The apricots were plump and delicious. I would definately order these again. My sister says she always looks forward to these glazed apricots that I send to her for Christmas and on her birthday. She raves about them. I must admit, I order these for myself so thank you SNC! These glazed apricots are the best I've ever tasted. Don't even bother getting them somewhere else. ConsThe tin takes too long for me to open (not really, but the apricots are just that good) ! Was a gift for my father-in-law and he loved it! 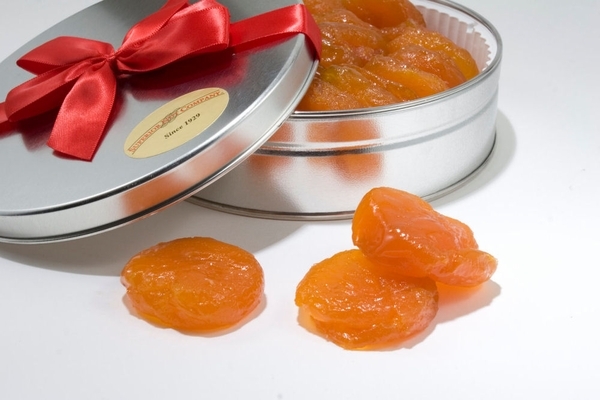 The recipient loves glazed apricots so I decided to send the Apricot Gift Tin from Nuts in Bulk. Apparently these are "way better" than the ones from your competition. I know I will be ordering from Nuts in Bulk again and look forward to tasting your other products! Thank you. I bought a tin of glazed apricots as a Mother's Day gift to myself. I didn't know what to expect, but know from past experience with Superior Nut that their products are exceptional. I was not disappointed. The apricots were large, plump, sweet and just delicious! I love chocolate but I can honestly say these were better than chocolate.....I have no higher praise! First time ordered this apricots. When I opened the tin, I was surprised -- Wow, it is so plump and large size! I've never seen such size. It is so delicious, too. I had glazed California apricots that I like so much, yet these are much larger and thicker. Thank you for bringing them to share these great products! An excellent product. Always delicious. Have ordered these for several years and they make great gifts. ProsDelicious. A good value. Delicious. Good options to choose from. Did I mention delicious? ConsNobody every gives me one for a gift. I used to buy apricots for my daughter at Christmas from Harry and David, but they don't carry them anymore. Went on the Internet and am glad to have found Superior Nut Farm. Don't know how they taste, but they look wonderful. Plump and juicy. They're in a tin in a box and were delivered promptly. I gave this as a gift and the 5 people who received them all had good things to say about the product. This was my first order and I plan to re-order more and similar products in the future. The challenge as a sender was since I sent to more than 1 address the notice was vague, just said sent to multiple locations (heck I knew that part) and there was zero in terms of tracking. Sort of nice to know when you spend $200 that yes 5 items were sent and yes here is the status of what was sent. The apricots were a much appreciated gift and my friend who received them was very impressed. They arrived on time and were the quality I expected. I bought these as a gift for my best friend's 70th Birthday. I wanted to send her something different and all I got from her were raves. She said they were so delicious she decided not to share and is going to have one every day so they will last almost forever. I ordered these online and I specified the date when I wanted them delivered. Not only was a weekend involved, but a holiday weekend as well and yet they came on the exact day of her birthday. Unfortunately, I didn't order any for myself, but I intend to in the future. I will definitely order these again for gifts and was very pleased that my delivery date was honored. Ordered them for mothers day! Mom Granny and Great Granny L O V e D THEM! ProsI WOULD RECOMMEND TO ANYONE! This is the third time I have sent these glazed apricots to my friend who loves them and savors each bite. I have never sampled them myself, but respect my friend's opinion that each delivery has been fresh and delicious. I'll continue to use this company as the quality is consistent and the shipping reliable. I buy the glazed apricots as gifts for Christmas for my husband and (2) grown sons . Nut Company gets two thumbs up from our family. My 91 year old father is a big fan of glazed apricots. He says these are the best he has ever had! I'm thrilled that Superior Nut Store carries these glazed apricots all year round. They're very hard to find at any local stores during the holidays, let alone all year round. Now, I only purchase from Superior Nut Store because they're fresh, delicious and very reasonably priced. I ordered these glazed apricots for a mother's day present. I admit I did it kind of last minute. The customer service was outstanding and one of the best I have ever had. I thought these would be better for my elderly mother then the usual flowers. They were delivered when I wanted and as I previously stated it was last moment. ProsMy mother said they were beautiful and tasted out of this world. Delivery was when I wanted. ConsNothing, there was nothing to dislike about this product and the customer service experience. Wow, these apricots were delicious. I will certainly order them again. They were huge and sweet. These apricots were larger and moister than any others we've tried (including Williams-Sonoma). The glazing was also just perfect. ConsDuring shipping some of the glazing leaked out of the tin making it a bit messy to open. I was unable to get my father's favorite apricots from that other "specialty kitchen store" for Valentine's Day and tried these instead. He prefers these from now on! These were bigger and did not stick together. They arrived quickly and were actually less expensive but much better, so thank you! ProsBetter product and less expensive. Wonderful presentation as a gift (no receipt included) and the note was nice, plus delivered quickly. Handy storage tin maintains freshness.. Excellent apricots. Delivered as promised. Thank you. These were sent as a gift to a dear friend. She has loved them so much she confessed she has not shared with friends who have come to visit. Thank you so much for making me look like a hero for sending such a high quality product. I purchased these glazed apricots to use in my truffles. I havenâ€™t made the truffles yet, but I have tasted the apricots. They are delicious. Sent as gift to mom. She thought they were fantastic. Purchased for my wife and she loved it. Package arrived on time as promised. Best glazed Australian style apricots ever! (Even Better than "NT"â€™s). I purchased some glazed apricots, they came well packed and were delivered on time for my momÃ¢â‚¬â"¢s birthday. She was over joyed with them. These were a huge hit. Will be buying more! Very soft and flavorful, but not too sweet. Better than the ones Iâ€™ve bought for years from Neimanâ€™s. The Apricots are just a fantastic treat. I use them for Christmas presents and those receiving them always rave about them. I usually buy these apricots from another vendor, but they discontinued this year. I found these on-line and sent to my mom for Christmas. She LOVED them and said they were better than the other brand. The shipping was very timely-right on Christmas Eve and I will definitely buy next year again. I ordered the bulk glazed apricots and couldnâ€™t be happier. They arrived quickly and tasted delicious! Perfectly prepared. Would order again! They were a birthday present for my daughter and she was delighted with them. Thank you! I am sure you have heard this before, but your products are exceptional! I have ordered nuts, but my family is mostly addicted to your glazed apricots. By far, these apricots are the best quality weâ€™ve ever purchased. Thank you for offering your superior quality to the public!! !